Chemically etched labels and nameplates are used in mining and other hazardous environments because the etching process ensures that the information is still legible even when the stove enamel has been destroyed, for example by fire or explosion. We utilize the very latest computer controlled metal punching presses. And have a vast range of stock tooling. For special requirements, we can supply custom tooling at low cost. Pressure sensitive adhesives can be coated onto the reverse side of your nameplates. The face side of the nameplate can also have a cleanly removable clear protective film applied. The face film can also act as a paint spray mask. Prestige Registered Office plaques are our speciality. For best effect, they can be mounted on to polished mahogany frames or plinths. Chemically Etched Brass or Etched Stainless Steel is the subtractive manufacturing process of using baths of temperature-regulated etching chemicals to remove material to create a recess with the desired shape which can then be filled with stove enamel. 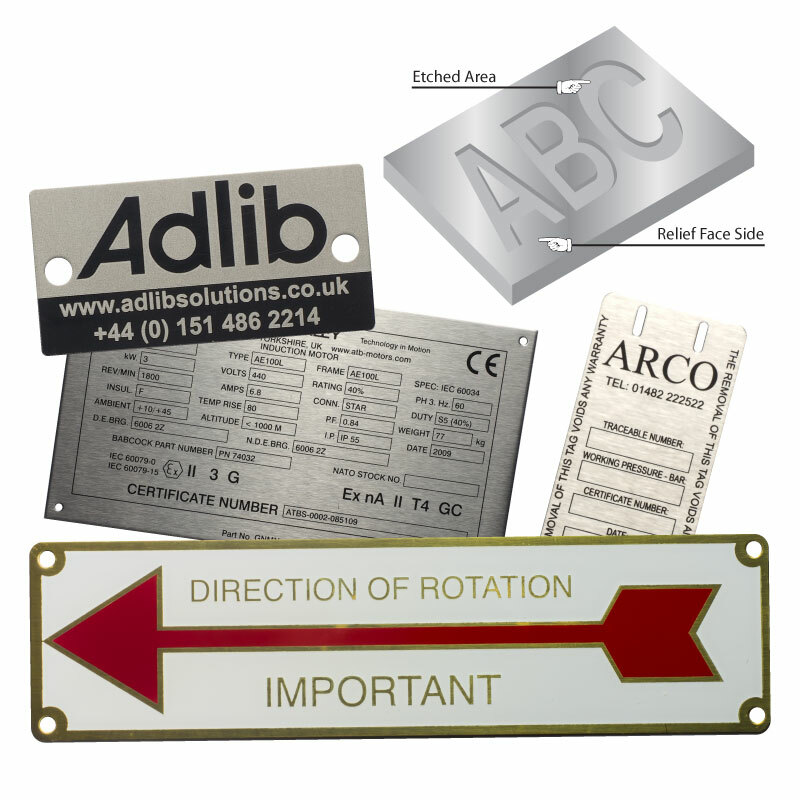 The process of making etched brass or etched stainless steel labels involves bathing the cut out areas in a corrosive chemical known as an etchant, which reacts with the material in the area to be cut and causes the solid material to be dissolved; inert substances are used as resists to protect specific areas of the material. Etched Brass and Etched Stainless Steel labels are legible even after exposure to fire and are therefore used in mining and other hazardous locations.